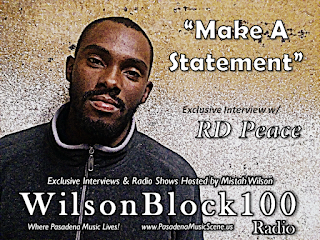 Gospel rap artist RD Peace from Pasadena, California is the very first artist who achieved 1,000+ downloads of their interview with Mistah Wilson on WilsonBlock100 Radio. It came as a huge surprise because Mistah Wilson claims to not have done anything more than he does for every other artist when promoting their interviews. We couldn't tell you how it happened, but it has! The first artist to break 300+ downloads and hold it for the longest was local jazz musician Sobukwe Toure. Others artists in the 300+ download club are J. Byrd and Warrior Richardson while Meddie Lanes, Eddie G, Maca, Ramon Barajas, Mak Boss, & Neffy are well on their way. RD Peace released a single called "The Prince" that he dedicate to his son. You can listen to the beautiful song he recorded in his exclusive interview with Mistah Wilson on WilsonBlock100 Radio. Great job, RD Peace!